I participated this month with an online blogging group called the ‘Secret Recipe Club.’ Once a month each group member is assigned a blog to post a recipe from by the groups moderator and mine this month was Feast on the Cheap. Don’t you just love the name of that blog? I mean really…don’t we all want to do EXACTLY that? It’s run by the mother/daughter team of Mary Anne and Mariel; do visit their blog not ‘just’ for fabulous recipes but they also do a cost analysis of ingredients. I know you will love discovering this blog; I know I did! As part of the recipe club, we get to pick the recipe we want to prepare and for me, this pizza was so perfect. I can not remember the last time I had a pizza with red sauce and meat. For me I think it all started with a pizza very similar to this one that I had at a local California Pizza Kitchen and I’ve not looked back. Our pizza of choice now most often includes an olive oil base and wonderful fresh ingredients. One of my favorites includes spinach, sun dried tomatoes and feta cheese and another was this totally unique but Oh My Yum! Lemon Ricotta Pizza with Herbs and Honey. I’ve made my own version of Feast on the Cheap’s White Pizza with Sweet Pears and Balsamic-Glazed Figs; changed ever so slightly and not quite as cheap! I’ve switched out the cilantro for some walnuts and used more pears and cheese I admit. I served this for dinner but it would also made a terrific appetizer if cut into smaller portions. I would typically make my own pizza dough but I didn’t have any whole wheat flour; was at a market to get some pork belly for bacon (yes, that post will show up soon!) and saw little bundles of whole wheat pizza dough made by Il Fornaio Restaurant and Bakery. They don’t sell the dough to the public in their restaurant but it’s available locally at Tony’s Market. I had never tried whole wheat pizza dough before but it seemed perfect for a pizza with fruits, nuts and cheese and it was exactly that. White Pizza with Walnuts, Pears and Balsamic Glazed Figs – and a Secret! Preheat the oven to 500 degrees. Pre-warm an empty baking sheet about 5 minutes before you’re ready to bake your pizza (this will result in a crispier crust if you don’t have a proper pizza stone). In a small saucepan, combine the figs, 2 Tablespoons of olive oil, Balsamic vinegar and minced garlic clove over med-low heat for 1 minute – until the figs just start to soften and the vinegar begins to sizzle. Remove from heat and set aside. Roll out your pizza dough on a well-floured surface – be sure to flour your hands and the rolling pin too. Once rolled out, brush the top of your dough with the remaining Tablespoon of olive oil. Assemble your toppings starting with half of the cheese mixture, followed by the pears, the figs, the walnuts and finishing with the remaining cheese. Use two spatulas to place your assembled pizza on the hot baking sheet. (I cheated here...I just put the dough on the hot baking sheet and assembled it quickly to avoid the transfer business). Turn the oven temperature down to 450 degrees and bake for 8-12 minutes – timing will depend on the thickness of your crust and your oven, so be sure to check after 8 minutes. Once your crust has risen and has turned a nice golden brown, remove from the oven. Serve hot. It is almost fig season where I am and I can’t wait to try this pizza when they are ripe! I did use dried figs for these but I’m with you…can’t wait to do it again with some fresh figs. One of my most favorite recipes…they were a sweet cookie with a touch of salt way before it became trendy. Congrats Barbara! I love the leap, and the change; change is always good. I cannot wait to read about all the wonderful new things you have got going with this new site. It looks delicious!!! Thank you Dara…I’m now anxious to finalize so many after the fact details; who knew just how many places were tied to VLS? Kim…you are too funny and you are so right. When you do this for a living and then do your own…well, the piddling around with it could go on forever; had to just pull the plug! Congratulations on the new/renewed site. It looks great. Now, I’ve gotta start looking at all those archived recipes. Thanks Andrea…I can’t deny that I’m pleased to have the bulk of the work behind me. Breathing a bit now. Congratulations on your new home! It;s very lovely and I look forward to lots more good reading! In the meantime that pizza looks incredibly good! Thank you Maris…it’s actually starting to feel like home now. I swear, Tony’s has so many little hidden secrets that I’ve not found, not noticed, or overlooked. I’ll have to try that pizza dough. Isn’t that the truth Lea Ann; considering how small they are…there are a lot of hidden treasures. Too many sometimes; I am always so tempted by everything! Wow Barb this looks really wonderful. It looks like the name change is going well. . . a rose by any other name. I’m so sorry I couldn’t make lunch the other day but I am happy to say I have cucumbers fermenting as I write. Now, I just hope I don’t kill the family. If I do Scruffy may just need a place to stay. Thanks…me too! Now to get to everyone’s blog…quite the feat in the same week I decided to publish a new website I must say. So I’m more the turtle than the hare but it will happen! Now this is one lovely pizza! I love the flavors that you used and it’s just so gosh darn pretty, too. Wonderful recipe. You have a great blog and I’m so glad to have found it! 🙂 I’ll be coming back soon. Thanks Mardi…I love both! And now on to those after the fact issues huh? This makes an awesome appetizer. . .just looks so good! I admit…I did it for lunch but I agree…next time will be doing just that too. You said you were busy and had lots of things in the fire so too busy to keep up with RSVP, but you undersold the deal big time. The new site is so much more YOU and is beautiful. Crisp and clean and all about the food. I wish I could hire you to revamp me, but I hope to spend many happy years learning from you by visiting your new/old blog world. Heading to Secret Club now. I can’t wait to get the pizza oven going…this looks so good. This is definitely one of the irons I had in the fire that might have pushed me a bit over the edge! So glad you participated…stay tuned; there will be more! First…love, love, love the new site! It is stunning and I am so excited for you and what’s to come. It may be scary, but oh so exciting!! Congratulations on your new home & your new look, Barb. It looks wonderful! This pizza is the perfect combination of sweet and savory and is certainly going straight to the top of my “recipes to try” list. You hit the nail on the head…great combo of sweet and savory. I hesitate to call it a ‘girls’ pizza…thinking if real mean eat quiche they would surely also eat this, right? This looks so fabulous: I’m always on the lookout for new creative pizza recipes! I’m not going to lie…using that ready made whole wheat dough made it so easy that I’m going to keep it stocked in my freezer. I’ll be doing a lot of experimenting this summer…can’t wait to try grilled pizza. Lovely layout and a recipe that will nip at my red high heels until I attempt it. Congrats on the “move” I lift my bourbon glass in celebration. Cheers! I will not be happy til the day we both lift those glasses…together. Thanks for stopping by Joyce. I’m loving your new home here! Everything looks great, including that pizza which I must make soon, I love a white pizza. Thanks Sylvie; very much appreciated. Wow…love the new look! Of course I loved your old one too. Now I’ll be off to read of the big change in a few minutes. Wanted to let you know this pizza sounds and looks amazing! I LOVE California Pizza Kitchen, and first discovered it in Hawaii back in my Navy days. Their five cheese and tomato pizza is to die for. It’s the first time I’d ever had fresh basil, fontina cheese and smoked gouda cheese. I’ve heard of the secret blogger club thing, and am very interested in joining in. I’m with you…tried so many unique varieties there…really don’t get why I never did this before; I just love pears mixed with some savory ingredients. I love different kinds of pizza and this looks fantastic! I love all these blogs we’re discovering. Love your new digs! I’m so glad you have embraced your beginning and are now here! I look forward to your recipes and your stories. Congrats! Hey! Hi! Thanks Robyn…look forward to catching up soon…so glad for you too. I love Feast on the Cheap! What a terrific recipe to try as part of the Secret Recipe Club – your white pizza with pears and balsamic glazed figs looks incredible! Thanks Jeanette; a great find for me too, I love their site. What a delicious looking pizza. That’s better than anything in a restaurant for sure. It is…truly Feasting on the Cheap! Deeba…well you know…I have just a bit of experience. You on the other hand are the staging and photog extraordinaire…you rock too! The new site looks great Barb! Always very exciting to launch something new! But the pizza… oh my. it looks and sounds and probably smells and tastes fabulous. Mouth watering! Thank you Melissa…exciting as well as a big relief. Maybe I’ll sleep tonight…that would be fun! Pizza was fabulous…perfect for a Girls Night In. Come on down! Congrats on the re-launch. I never would have thought of combining these ingredients on a pizza, but it looks great! Thanks Tessa…it’s the thing that once you try it, you do sort of have a ‘duh, why didn’t I think of that’ moment. Perfect with the whole wheat too. Your new site and this recipe both look amazing! Congrats on the switch and so glad you’re playing along with the SRC! Thanks Winnie…what a fun way to meet a lot of new people AND experiment with a new recipe. Glad you’re in it with me! Your pizza is so creative. I love the combinations of flavors and textures. I’d also like to know more about this “secret recipe club” and how does one become a member? Is it a closed group? It just sounds like so much fun!!! Anyway, LOVE the new site Barb. Best wishes and continued success. Can’t wait to see all the exciting new posts and recipes you’ll be sharing. I’m off now to check out “Feast On The Cheap”. Yes I agree that that name sums up the perfect pairing. Congratulations on your re-launch! I love the new look and the new/old name. The pizza looks great, what a wonderful combination of flavors. Nifty idea: “secret recipe club”. Thank you and it’s been fun…I like that we could pick what we wanted to make; most of those group things where you all make the same thing don’t appeal to me as much. Join us! What wonderful flavor combination! And all the best with your “new identity”:)! Thank you…and I’ve so glad this part is now on it’s way. Some loose ends to tie up and I can make that big sigh of relief soon. I absolutely love this pizza. I can see it being used at parties, or as a jazzed up pizza night. I really want to try it! Then do and please let me know how you like it too, OK? I can just imagine how great this would be in individual tarts for a dinner party. Fabulous combination of flavors! I’m even making for the next time my local blogger group gets together…and that’s 10am. We like a blend of sweet and savory and this is the perfect pairing of both. Definitely different ingredients that what I’m used to on a pizza but I would try it in a heartbeat. Your pictures are beautiful! Thank you Tami…thanks for visiting too. I love the colors and the pics on pins at the top – wonderful site. 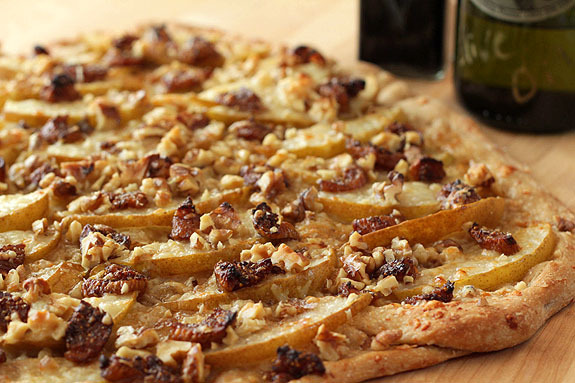 You did a great job with the pizza, and I love pears and walnuts. I great find for me. And glad to see you…I’ll return the visit too. This looks so yummy! 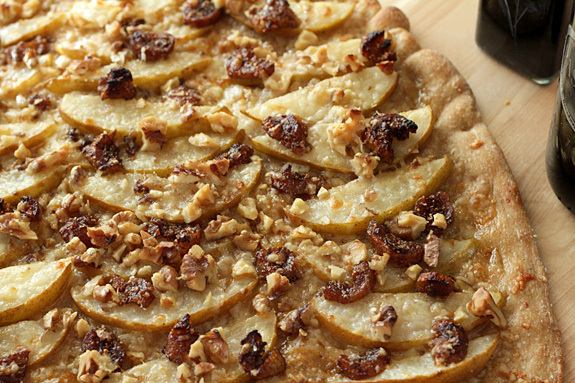 I love using fruit on pizza – pears and figs sound like such a great combination, especially with walnuts! Yum!! Not shy about how good it is…all I can say is…DO IT! Congratulations, Barb! I love the new site, and the return to your old roots! I also loved reading the backstory on VLS – kudos and here’s to 15+ more years of sharing your recipes with us! Thank you Amy…where ya been? I’ve missed seeing you on Twitter it seems so very nice to see (and hear) from you here. While I was a huge fan of VinoLuci, I totally understand the change and absolutely love the new look and name of your blog. The clothespinned photos are adorable. And what a great recipe to kick things off. I love white pizza and adding pears and figs to it sounds absolutely divine. Congrats on the new look! More thanks…so glad it’s been so well received. A big Whew! The site looks awesome. Now following you. The pizza looks so good. I’m so used to the red sauce pizzas, love how different this is! Give Olive Oil a chance…you will not regret it, promise! Wow… that word seems completely inadequate but that is the first one that came to mind after viewing the “new” look!!! It is truly gorgeous Barb – I love the clothspins holding the photos – too darn clever!! Love the new avatar too – it seems SO you!!! The Secret Recipe Club sounds like a total blast!! Great way to find new blogs!!! Thank so much Nancy. I’m very excited…I wanted a way to display a variety of photos depending on the season and this was easy and well, meaningful too. You are so sweet; thanks for your support. Love the new site — or the work you’ve done on an older one, right? Love the idea of the secret recipe club, too. Whte pizzas are a fave, but I’ve not tried one with figs. The ingredient list sounds heavenly. The new blog looks fantastic! And so does this dish!! Where did you find the figs? The recipe called for dried figs Anne-Marie so it was easy…local Sunflower Market had a couple of different varieties. I can’t wait to try it with fresh figs again this summer but these were fine. I’m glad you did too! Welcome. So glad you made the change, everything looks great! the pizza looks and sounds amazing, thanks so much for participating! I love the toppings you chose and think you’re right they pair well with whole wheat. Will definitely keep this in mind when the figs start coming in. LOVE this! All of the ingredients sound so perfect together, and the whole wheat crust is the perfect complement. Great choice! This pizza looks delicious and you’re the second “secret” clubber I’ve read this morning! I just might need to join! Love the new site! Welcome Home! Oh definitely a great choice! I love the flavor combos! I’m so glad you enjoyed it – and your site looks gorgeous! I so did…I mentioned to another comment, so very much like one I used to get out that I loved…not sure why I never tried before but appreciate your inspiration…cause now I will do it more often! Fabulous looking pizza. This is one that I must try soon. I can’t wait to hear what you think…sometimes I wonder if guy would enjoy a pizza as much without, you know…meat! Let me know if you do please? You did ship me some of this as well right 😉 This is just too good to pass up today! I would have but I ate it all up. Lip smacking good. Love the new blog look (photos with clothes pins is so cute) and this pizza! Bella! Enjoy your new *Secret Recipe* club (will go and check it out). Who needs James Bond adventures when they can come to Creative Culinary?! That sweet pizza is just terrific! A divine treat. First – love the new site design and name! Absolutely love it. I don’t know if I’d be brave enough to do it so I really admire you for taking this huge step. Second – isn’t Feast on the Cheap great? I’ve followed them for a long time and have never been disappointed with one of their posts. Beautiful, delicious food prepared by lovely ladies. Love your addition of walnuts to their already wonderful recipe. Thanks so much Lana. I don’t know if it’s brave or foolhardy but it’s done. The new domain for my blog has been such a long time part of my recipe world, it is like coming home again. And yes, you can! And yes…love them, what a great find! Great new look! Love the new name and header. The pizza looks fabulous. Off to check out Feast on the Cheap. Thank you Barbara…I actually was on your site after I started with the photo array but the idea was in my head and I could not turn back. Tried to make it unique…you know, our names are enough, right? Thanks and Happy Monday to you too! And thanks for including me on your site with your Monday links…so sweet, it’s much appreciated. Times like this I wish all of us were closer; would love to do a Girl Night In with you and Wendi and Shari and…well, you get my drift! This is definitely a favorite of mine. I always order a similar pizza at a fantastic restaurant up at our house in Rhinebeck. Now I can make it myself. It’s funny that’s it’s so close to one I loved that I never tried to recreate. Was meant to be Ken!